WHAT! (1963) Christopher Lee, Tony Kendall, Daliah Lavi, Harriet White, directed by Mario Bava. Perhaps the most visually beautiful horror film ever made. The setting is a sinister castle. Lee is a sadistic noble who whips the wife of his brother. Chris is later found dead, but his ghost comes back to haunt the castle. A classic Euro-chriller. From a nice Technicolor 35mm print. 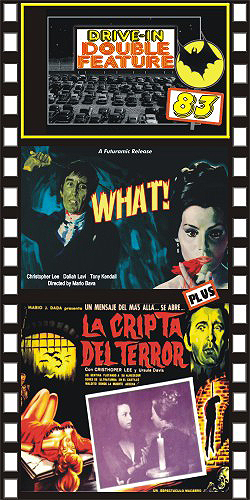 PLUS: TERROR IN THE CRYPT (1963) Christopher Lee, Ursula Davis, Jose Campos. Lee is Count Karnstein, living with his daughter in a crumbling castle. Decades earlier, a witch put a death curse on their family. By legend, the witch will someday be reincarnated as a Karnstein. Years later, the Count fears his daughter is the one. Soon a tale of supernatural terror unfolds.